With fewer than 200 shopping days until Christmas, producers and teachers, churches, community centers and dinner theatres are planning their holiday productions. We are proud to introduce you to an extraordinary musical that is destined to touch the hearts of everyone fortunate enough to experience it. TOUCH OF THE CHILD is undoubtedly the only musical with endorsements from the likes of Cole Porter, Irene Dunn, Ezra Stone and Katharine Hepburn, to name but a few. Yes, the musical's driving force and one of its creators, Max Showalter, has made many friends during his seven-decade career in the entertainment industry. He remains one of the most recognized character actors in film and television, and his credits as a composer include the Broadway musical HARRIGAN 'N HART. It was for one of his closest friends, Mary Martin, that he created TOUCH OF THE CHILD. It was premiered on her birthday, December 1, 1982, and marked her first public appearance following a near-fatal car accident. Telling the Christmas story, that initial production was a benefit for a parish in West Hollywood and starred Victoria Mallory and Laurence Guittard as Mary and Joseph, featured Jan Clayton and Patty Duke, with Marge Champion supplying the choreography. "I left that night with renewed faith that miracles do happen," Miss Martin said after the emotional performance. Showalter says that TOUCH OF THE CHILD will always be dedicated to his beloved friend. "When I last saw her in October 1990, she made me promise that I'd do it again." We are delighted that audiences everywhere will now be able to share in the magic of this very special musical. The story begins with the betrothal of Mary and Joseph and follows their emotional journey through the annunciation and their wedding, to the birth of the Child and their eventual return to Nazareth. Between the musical sequences a contemporary narrator examines our relationships with faith and with fear, exposing the fragile humanity of all people. While capturing the spiritual wonder of the Nativity, the creators have also managed to grasp the simpler, sometimes evasive human aspects of this great and moving love story. They've peppered it with great wit and humor and the result is a full-fledged musical. "TOUCH OF THE CHILD was conceived from the start as an entertainment, not a lesson," Showalter explains. He saw the piece more in terms of a Broadway musical than a pageant. Showalter's music, by turns romantic and inspirational, soars with exuberant choral passages one moment, then calms to a hush with an intimate ballad the next. The lyrics (by Showalter, Peter Walker and William Howe) and book (by Father Bob Curtis) form a beautifully crafted portrait of a family in which we can all see ourselves. TOUCH OF THE CHILD has principal roles for 3 women, 7 men and a narrator. The chorus can be as large as desired, and choirs can easily be integrated into the production. The orchestration calls for 6 musicians. As always, The R&H Theatre Library is happy to provide perusal materials upon request. 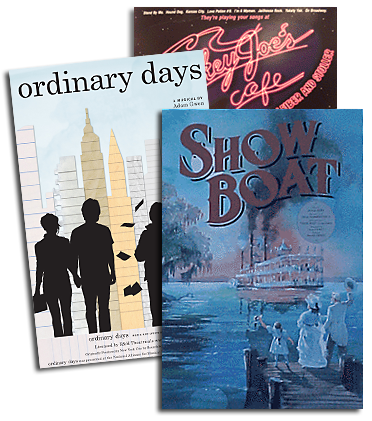 For a catalogue of musicals available for performance, please contact The R&H Theatre Library at 229 West 28th Street, 11th floor, New York, New York 10001; Phone: (212) 564-4000 or 1-800-400-8160; Fax: (212) 268-1245.